1MB has never officially been a valid size, but I assumed it was slightly possible in cases like this with what is technically just developer roms. 4MB, 8MB, 16MB are your common GBA ROMS, and 32MB roms are only uncommonly found with a handful of GBA games. I definitely know neither the Aurora or 10ANNIV would be 32MB, since the devcarts' max size is 16MB. However, I'm being told by someone that they should've originally been 4MB, which seemed likely to be the case anyway if 1MB shouldn't exist. The problem is, the dumping software has never dumped neither as a 4MB, or even 8MB. Has anyone had any luck getting this to work on an emulator? The only wireless adapter emulator that I've gotten the distribution cart to recognize is vbalink 1.8, but it always crashes either Firered or the cart when they connect. It should work fine with VBALink 1.8, not sure why it's crashing for you, it always works for me. Not sure if it matters for this rom, but try to make sure the distro rom is in the first VBA window, and the game in the second. Make sure Wireless Adapter option is checked off. Make sure it's set to not freeze when a window is inactive. If you're still having trouble, I can look into it when I have time. I haven't messed with this in months, so I may be forgetting something important. In the end, it could just be a problem with your computer causing it to crash, because it should work if done right. Thanks a lot to the user Deoxyz to share this amaizing event room, i was serching it a lot since 2004; when event Electronic Game show was held in México city, in that right moment I still didn't have the games L.G & F.R and i lost my oportunity to have that ticket. By the way, I was working on a translate spanish version of the room, It's all functional and i want to share it with all! Deoxyz, InsaneNutter and UnknownRespected like this. I'd be careful with sharing this. It might hurt our chances to get the legit European Aurora Ticket ROM (which has all five European languages AND works with Emerald). But it's good to know the ROM is easily edited, considering we'll probably have to do so if we want a distro ROM for the Japanese Wonder Cards and the US Mystic Tickets we DO have. 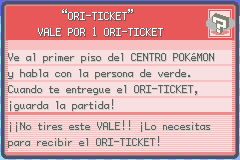 @Dark_Lucario do you recall anyone going to a Mystic ticket event in Mexico? Do you know if they could download the ticket with non-english roms and if the received card was in english by any chance? Hi @suloku, The games used in latinamerica its the U.S.A american version, we don´t have translated spanish version. but some times i like to download the spanish spain version to play. I used to have a friend, he got the Aurora Ticket in that event, but he sold his F.R copy years ago and i don`t have contact now with him. But the next year (2005), i got my own copy of L.G and in that same event (Electronic Game Show) i recive the Mystyc Ticket. By the way, I still have that cartridge with that file, i clearly remeber the event, because of the hot pretty american lady with the distribution cartridge. If you want, i can look for my "Club Nintendo" magazines, where both events was announced. Sorry, i dont have any idea, after the "Giga codes of MORFEO" appeared on the web, i guess there would be no problem to share this. I don't understand why people still think that one person hacking the rom and sharing it can interfere with actually getting the real thing. Especially in this case where it would be easy to verify without buying it, by asking a potential seller to show off sending to different languages and/or Emerald and then you know they didn't just put a hacked US rom into a rewritable cart. I've been tinkering again with this, and i still can't get it to work. I've tried it without checking the wireless adapter option, but since the original deoxys cart uses the adapter it would force me to reboot with it checked. I've also tried with and without a BIOS, and it fails either way. My computer is fairly new and can run gba-gamecube link emulation, so I would assume my computer's lack of power wouldn't be the issue. What options do you have checked of on vba when you emulate this deoxys cart? I can't seem to be able to find what you're doing wrong. Check the "Link Options" option right under where you check on/off the Wireless Adapter, and make sure it's on "Single Computer". If that still doesn't work I'm clueless, but let me know because in that case I can send you my VBALink configuration files to load with your VBA, which should allow you to run VBA exactly as I am. That'll determine if it's your computer or something you're doing wrong with VBA. I managed to get VBA 1.8 working by using its Network capabilities. I set up my first window to be the host of a link network, and made a second window on the same computer the client and copied in my IP address. For some reason it now works, but doesn't if I use the "single computer" option. Thanks again for going through the effort of obtaining this for the community and helping me! I created an account just to say that what you guys have been doing here is amazing. I taught I was the only one trying to stay 100% legit in completing the Pokedex. Here in Portugal we didn't had any event in Gen lll so completing the Pokedex was impossible. Now it's possible to get Celebi from the Japanese bonus disk, Jirachi from Pokemon Channel (I'm european ), Lugia and Ho-oh from the 10 anniversary or the Gamecube games and Deoxys from this event that you guys made available to us. Maybe, but for now Mystery Mew is pretty legit too. Like UnknownRespected said, we currently have the Mystery Mew savefile. That Mew was actually distributed by direct trade from that exact savefile, so you would be obtaining it "the way it was supposed to be given". However, the Aura Mew distribution rom is something we've been working on obtaining since April. The problem is that simply I can't afford it all by myself after buying those other carts, and hardly anyone is willing/able to contribute towards helping us obtain it. So I don't know when or if we'll actually be able to obtain the rom. Oh I didn't know that Mew was distributed by direct trade. I taught that save file was from someone who attended the event and got it. Anyhow I really appreciate the effort you have been making. Hey, found this site / thread from a video tutorial on YouTube (see below). Wanted to say thanks a lot for this, I will be ordering the pieces I need and trying this out soon. I've got a mostly-complete living dex on my copy of Sapphire, bar 5 (Mew, Lugia, Ho-oh, Celebi, Deoxys). I was able to get Jirachi via Pokémon Channel for the GameCube, and I am still interested in completing the rest 100% legit. I've found the thread for Mew as well; are there any more distribution roms like this for the others?